In recent months I have been watching my dad disappear into the impenetrable fog of Alzheimer’s disease. Among those things being lost are nearly five decades of our shared experiences in amateur radio. The present is an uneven mix of good and bad days, but occasionally something drifts in from out of the past to brighten even the worst of them. Carl and I continued our correspondence, and as I filled in the details about my radio, he explained the motivation for his own Ocean Hopper search. Common to nearly all vintage-radio enthusiasts, whether their collection is a single piece or numbers in the hundreds, is a desire to have a duplicate of one’s first transmitter or receiver. So it was with Carl. He had obtained his original Ocean Hopper in about 1958 through a trade with Jim Eblin, K8DHW, a family friend who lived in Athens at the time. That Ocean Hopper was Carl’s first shortwave receiver, and with it he took his first steps down the path so many of us have walked, although his journey to a ham ticket did not end until 1981. That common thread also runs through many amateur radio lives as we deal with education, career, family, and other responsibilities along the way.net. in the Ten-Ten International Net and the Christian Amateur Radio Federation and is active in his local club, the Athens County Amateur Radio Association. Carl enjoys QRP with the Elecraft K2 he built and now has an Ocean Hopper revival project to his credit. For most of us, the name Ocean Hopper calls to mind the Model 740 and 749 three-tube Knight-Kit receivers sold by Allied Radio in the 1950s and ’60s. As early as 1939, Allied published the circuit for a two-tube “Ocean Hopper” in its Radio-Builder’s Handbook. The company sold a kit of parts, complete with a drilled and punched metal chassis and panel, through its Knight division. The original OH design used 6J7 and 6C5 octal-base, metal tubes. Power for the set was furnished by A and B batteries or an AC supply constructed according to plans in the handbook. 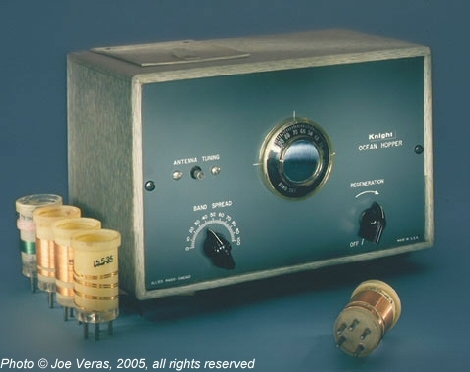 Subsequent editions of the handbook offered new versions of the Ocean Hopper, and the tube lineups were changed to permit AC/DC operation, eliminating the power-supply transformer and the necessity of a separate filament supply voltage. The last two-tube Hopper employed 12J5 and 117P7 tubes. Production of this version ceased in 1953, and it was succeeded by the Model 740. Early in the summer of 1957, while visiting my grandmother in Chicago, Dad and I made a trip to Allied Radio, then at 100 N. Western Avenue, west of the city’s Loop. For a kid just getting his feet wet in the radio hobby, it was a died-and-gone-to-heaven experience. The ads on the pages of ham magazines suddenly had come to life. Along with its own line of Knight-Kit equipment, Allied’s large store carried new and used gear from nearly every other manufacturer. I also remember seeing turntables, amplifiers, and speakers — what we called hi-fi gear back then. Allied was also an incredible parts house. If you wanted to build or repair something, it seemed to me that anything needed could be found on its shelves or in the warehouse. All of these things — the expensive ham and hi-fi gear, all the tubes and parts — were just momentary distractions. I had come to Allied on a mission. In my pocket was about fifteen dollars in small bills and loose change. My heart was set on returning home with a Knight-Kit Ocean Hopper. I did not go away disappointed, but when it came time to make my purchase, I faced some tough choices. As I stacked my dollar bills on the sales counter, then counted out the change beside them, it was apparent my funds would come up short of the amount necessary for a full-blown Ocean Hopper outfit. I could afford either the cabinet or the optional coils, so I decided in favor of the coils — although I did not get the coil that covered 155 to 470 kHz. I was eager to assemble the kit that evening, but common sense, and Grandma’s lack of a good radio workbench, dictated waiting until we returned home from Chicago. Dad gave me a short tutorial in the use of the basic tools and techniques required and then turned me loose. He checked my work as things progressed, and when I reached the rudimentary manual’s last page it was show time. The Ocean Hopper came to life as its tubes warmed up, and Dad ran me through the basics of adjusting and tuning a regenerative receiver. He seemed to get quite a kick out of the Ocean Hopper, possibly because it was so similar in concept to the homebrew receiver he himself had used as a boy ham a quarter of a century earlier. Dad did not consider the Ocean Hopper’s AC/DC operation to be a convenience feature, but rather a safety hazard. Fearful that his 12-year-old son’s fingers might carelessly come in contact with the receiver’s hot chassis, he constructed a wooden cabinet to take the place of the one I was unable to afford at the time of purchase. A hobbyist woodworker, Dad’s skilled craftsmanship produced an enclosure that gave my Ocean Hopper the look of a piece of fine furniture. This is one of the things I found so interesting and coincidental about N8VZ’s initial question about the radio and its cabinet. My reply to Carl’s e-mail related the story of the radio’s purchase at Allied and how it came to have that non-factory cabinet. He also mentioned a matching wooden coil rack, which I did not remember but also did not discount having. My memory is sometimes crowded with the many radios that have passed through my hands and occupied space in my shack since that first Knight-Kit receiver. Not long after my first correspondence with Carl, I brought up the subject of the Ocean Hopper while visiting with Dad. Up until then, the day had not been a particularly good one, at best a 5 on a 1-to-10 scale. I watched the fog of recent months part. I saw light come into his eyes as if they were bringing the events of nearly 48 years ago into sharp focus. Without prompting, Dad talked animatedly of our trip to Allied Radio, the construction of the Ocean Hopper kit, and the wire antenna he helped me put up in the back yard. He recalled his concern over the set’s AC/DC circuit and the cabinet he made for it. Our day moved rapidly upscale. It had started as a 5, but reached a 10 as far as I was concerned. That this progression was radio-related did not surprise me at all. Amateur radio has kept the two of us in touch over the years. It has done so in a literal sense when we lived in different places — sometimes on different continents. It has kept us in touch in deeper ways as well. On this particular afternoon, it allowed us to reach out and touch across a gap that has become increasingly difficult to span. I last remember having my Ocean Hopper in 1960 or ’61. I think it was part of a group of things I traded in at Satterfield Electronics in Madison, Wisconsin, or I may have swapped it to one of my young ham buddies in Green Bay. Curious about where it has been all these years, I decided to try tracing it backwards from Carl’s purchase. It turns out the immediate previous owner was Karl Ayer, N9PXE, of Mequon, Wisconsin. That puts the receiver back in the right state, but when I contacted Karl, what he had to tell me cast doubt on the radio’s being the same one I built. He had gotten the Ocean Hopper from the west coast. It was in poor condition and did not have a cabinet. The wooden cabinet on that receiver now owned by Carl (N8VZ) and the coil rack were both made by Karl (N9PXE). My call became associated with the radio in a roundabout way. Karl obtained a manual for the Ocean Hopper from Harry Blesy, N9CQX, of Hinsdale, Illinois. My call was written on the documentation, no doubt a relic of the period of time when I owned a Hopper. The paperwork with my call went to N8VZ when Karl sold the radio to him. Harry, N9CQX, remembered his transaction with Karl, but I was unable to backtrack on information he provided about a couple of Ocean Hoppers he had sold. The sales took place several years ago, and the trails have long since grown cold. At the very least, Harry had the instruction/construction manual that went with my original Knight-Kit. At one time he may have had the radio as well. It’s impossible to tell now or know where it might have gone. The Ocean Hopper Carl got from Jim, K8DHW, is lost to the ages as well. After serving as his first shortwave receiver, its chassis played host to a number of construction projects before disappearing entirely. His recent purchase on eBay started a new phase of Ocean Hopper ownership, initiated our correspondence, and provided the genesis for this column. This story would end best with Carl’s receiver being the very kit I bought and built, with my call scratched on the chassis and my fingerprints all over the knobs. There are ways in which it could still be my Ocean Hopper, but they require twists and turns that cannot be documented, missing links that cannot be filled in. Most likely it is a different radio, but I would not trade away the experiences of recent days nor the opportunity to relive those of the past. Wherever it is, that old Ocean Hopper has repaid my $15 investment of grass-cutting money many times over. Dave Ishmael, WA6VVL, was kind enough to let me photograph his Model 749 Hopper for the illustration accompanying this column. I’m grateful as well for the assistance he provided in researching the whole Ocean Hopper line. If you have an Ocean Hopper restoration in the works or are just interested in the breed, Dave has resources available you may find helpful. For an article containing complete information on the receiver, as well as restoration from start to finish, point your web browser at http://members.cox.net/daveishmael/OH.htm. Additional details on the Ocean Hopper and other vintage gear have been combined into an anthology that is available at http://members.cox.net/daveishmael/VA.htm. Dave’s e-mail address is daveishmael@cox.net. Whether it’s assisting with a radio restoration or cultivating the aluminum farm in the back yard, ham friends are remarkably generous with their time and help. Thanks to my fellow members of the Birmingham Amateur Radio Club, Jerry, N4JF, Jim, W4ATK, and Gene, K4NWU, for taking a Saturday to put the finishing touches on an antenna project here at K9OCO. We all followed instructions from Ken, KT4KI, who ran the show from the top of the tower. This article was originally published in the March 2005 issue of CQ magazine. Photo and text Copyright Joe Veras, 2005, all rights reserved.